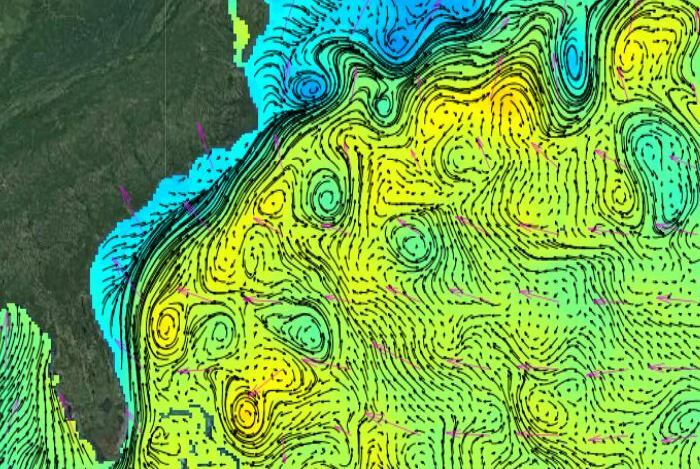 The position of the Gulf Stream off the U.S. east coast varies according to large-scale oceanic conditions. This plot of Gulf Stream long-term mean position (solid line) and its daily variation (dashed line) is based on AVISO daily sea surface height (SSH) data. Maximum SSH delineates the edge of the Gulf Stream. The 200 m and 2000 m isobaths are shown (gray lines), and difference (meters) in sea surface height from the mean is shown in color. Controls at the top of the Tracking page allow animation. The track is updated weekly.